The Butterfly Conservatory is a year round tropical paradise! It's located on the grounds of the Niagara Parks Botanical Gardens. It is easy to loose track of time in the world's largest glass enclosed butterfly conservatory. Before you know it you will find yourself transported to an exotic green and heavily misted rainforest. Insider Tip: Wear colorful clothing and you might be lucky enough to have a butterfly land on you. A red and black shirt worked for me. Yellow works too. This award winning 1,022 square meter structure (11,000 sq ft) is filled with 2000 free flying butterflies. There are about 45 species feeding from blooms and fruit feeding stations all around you. Follow a meandering 180 meter (600 ft) pathway through lush gardens surrounding a man made waterfall. The cut curbs allow for total accessibility. Make sure you don't miss the Emergence area. It gives a first hand look into the life cycle of the butterfly. You can actually see butterflies unfurling from their chrysalides and taking flight, if you are lucky. The Butterfly Conservatory is really something worth seeing, thought it can be quite busy. The first thing in the morning is probably your best bet if you don't like crowds. There is a gift shop, cafe, and fully accessible washrooms. During the summer months, you can enjoy the outside Butterfly Garden amid the 80 acres (40 hectares) of the Royal Botanical Gardens. Make a note of what plants attract our native butterflies. Plant some of those plants and create your own magical space. Educational Facts: 70 % of butterflies are obtained from special breeding farms in tropical, semi tropical Costa Rica, the Phillippines and Florida. The remaining breeding happening in NPC's own greenhouses. The lifespan of butterflies is short, so new additions are made weekly to enhance the viewing size population. Eurasian quails, turtles, goldfish, toads, and beetles . . . -clear dead butterflies -control parasitic pests -keep the insect population balanced. The exhibit hall lets you observe live caterpillars, enjoy interactive displays and brush up on all kinds of info on the life of butterflies. 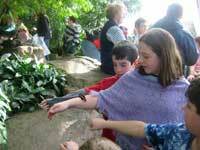 School visits can be arranged focusing on butterflies and their ecological importance. Butterflies offer clues to a healthy environment. They are a source of pollination. The flora (labeled for easy identification) provide a food source for caterpillars who in turn become food for predators up the food chain. May 22 - 23, 10 am to 7 pm daily. October 29 to December 31 5 p.m. Please note that longer waiting periods may occur during the summer months. Cost - Adults	$13.95; Kids 6 -12	$9.10; 5 and under	Free; Last ticket sold 30 minutes prior to . The admission prices are in Canadian dollar and do not include taxes. Parking at the Botanical Gardens is $5.00. Facilities - Wheelchair accessible, washrooms, gift shop, cafe, snack bar. Winner of the 2007 & 2008 AccessibleNiagara.com "Breaking the Barrier" Award, the Conservatory is fully accessible. Parking is $5.00.